Day 1: Queen Elizabeth Wildlife Safari. Day 2: Queen Elizabeth National Park to Bwindi. The day start with having breakfast, then embark on an early morning game drive along Kasenyi track and Queen’s mile in the park. You will expect to see cape Buffaloes, Elephants Topi, Kobs, Warthogs, Waterbucks, Hyena, Leopards, as well as the lions and lots of Birds. After the game drive, embark on the trip to Bwindi Impenetrable National Park via Maramagambo and Ishasha. Along the road via Ishasha you will have an opportunity to see the tree climbing lions, more antelopes, the waterbucks, Kobs, elephants, and buffaloes.You will arrive and rest at the exquisite Gorilla forest Camp where you will dine and spend the overnight. Day 3: Bwindi Gorilla safari. After an early morning breakfast you will be briefed by your tour guide and afterwards start your gorilla trekking journey in Uganda. Mammals here include majorly the endangered mountain gorillas, elephants, buffaloes, giant forest hogs, the rare golden monkey, black-fronted Duikers, bushbucks, leopards to mention but a few.The charming mountain gorillas form the highlight of the park, the time and terrain/track taken while looking for these beautiful primates varies according to their movements. Once tracked, observing, spending time with and photographing these gentle, peaceful and shy gorillas in Uganda is a unique, breathtaking, inspiring, and thrilling life time memorable adventure that leaves you desiring to have it again but takes one hour. As one of our clients lamented, ‘‘I will forever want to track and keep with these lovely animals and if acceptable, I would stay with them every day! !”.Overnight at Buhoma homestead/Buhoma community Camp booked on Full Board: Lunch/Dinner/Breakfast. Day 4: Transfer back to Kampala/Entebbe. After your breakfast embark on the transfer to Kampala via Mbarara in Igongo Cultural Center for lunch (Traditional dishes) but also you will visit the cultural museum here and embark on your drive to Kampala. On arrival in Kampala by 5.00 p.m local time you immediately embark on a mini famous Kampala tour which makes the end of your gorilla safari holiday in Uganda. 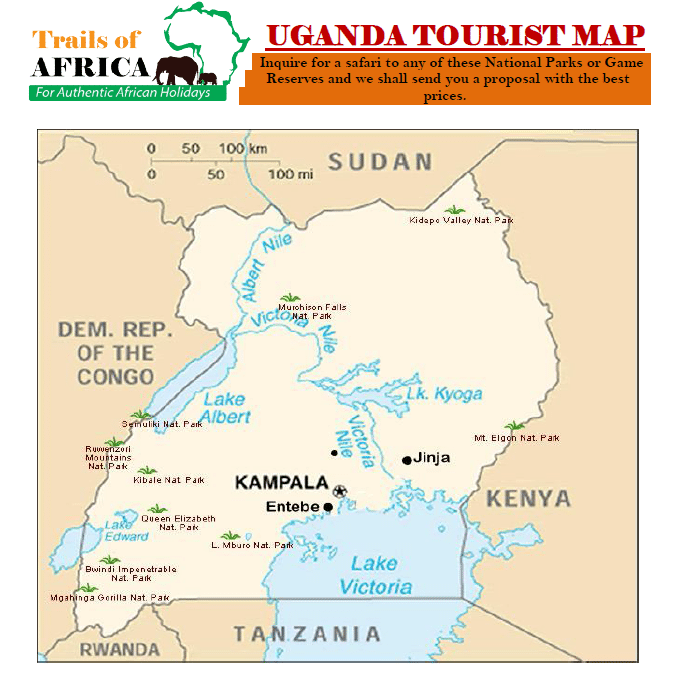 Ecologically, Uganda is where the East African savannah meets the West African jungle. Where else but in this uniquely lush destination can one observe lions prowling the open plains in the morning and track chimpanzees through the rain forest undergrowth the same afternoon, then the next day navigate tropical channels teeming with hippos and crocodiles before setting off into the misty mountains to visit the majestic mountain gorillas?